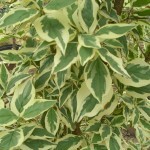 An upright, slow growing, small tree with leaves that are margined with creamy white variegation. Flowers in the early spring with small, bright yellow blooms that are followed by bright red edible fruit. The fall color is purple-red. 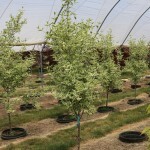 Grow it in full sun to part shade (protected from hottest summer sun) in a medium moisture well-drained soil. Makes a great accent tree in the landscape. It is not as prone to foliar diseases as C. florida.